Additional Info: The plant is branchy and features pale pink to white flower spikes, which have an inch and a half in length. 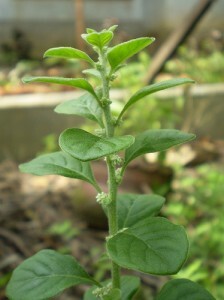 Elements Applied: Root is commonly applied in herbal medicine. Used For: The roots are specifically applied to relieve headaches and other pains. Root decoction is taken during pregnancy as a tonic. Additionally, the plant can be used to treat kidney diseases, gonorrhea, sugar in urine, and cutaneous affections. The plant is known in India as one of the most famous remedies for kidney and bladder stones. In Ayurvedic medicine the plant is prescribed in form of decoction for a period up to a week, and is stated to dissolve stones and clear the passes. Safety: There is no data concerning the herb’s safety level.